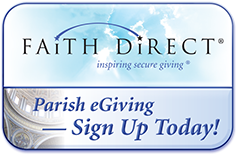 As of June 1st, 2016, we are introducing a new, convenient and exciting way for you to support our parish offertory and second collections: Faith Direct. This new method of electronic giving enables parishioners to make your Church contributions through either direct debit from your checking/savings account or through your credit/debit card. No more writing checks or searching for envelopes on the way out the door! Now you can apply the convenience of direct debit to your parish offerings in much the same way as you may now use it to make your mortgage, car or tuition payments. Through Faith Direct you can make all of your contributions to St. Andrew the Apostle via automatic payment from your checking account or credit card – just as you may do now with your mortgage, household bills, and other monthly payments. This is a great way to simplify your giving – and it’s the most cost-effective, environmentally-friendly way for us to receive your gifts. Sign up by picking up an enrollment form from the parish office or click below to enroll online today! Our parish code is NJ743. Faith Direct also offers you personalized offertory cards to replace your envelopes for the collection basket. Please join me in enrolling by visiting www.faithdirect.net to enroll securely online. Msgr. Louis A. Marucci, D. Min.